Claudia Jung, therapist and deputy chief of the German Specialist Integration Service, discusses how German supervisors can support local national employees struggling with emotional and behavioral challenges. Thirty-seven local national supervisors attended the Mental Health, Resiliency, Occupational Well-Being, Suicide Prevention awareness training here to help employees cope with, and overcome, emotional or behavioral challenges, Mon, Feb. 13, 2017. 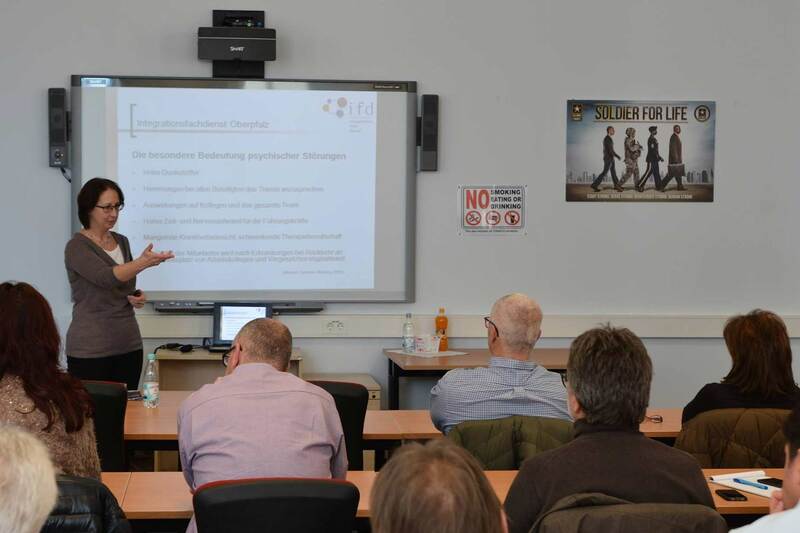 GRAFENWOEHR, Germany — Thirty-seven local national supervisors attended the Mental Health, Resiliency, Occupational Well-Being, Suicide Prevention awareness training here to help employees cope with, and overcome, emotional or behavioral challenges, Mon, Feb. 13, 2017. USAG Bavaria’s Directorate of Human Resource and Hella Wagner, the USAG Bavaria representative for civilian handicapped employees, invited the Specialist Integration Service of the Oberpfalz. Mr. Hans Dumbach, program manager for workforce development, highlighted the importance of being aware of employee’s mental issues. “While there are many military programs, like resilience training or SHARP, there is no specialized training with all the off-post resources and processes. “ Dumbach said. According to Jung, one out of five people develop a mental issue at least once in their life. Just 25% of the affected population actually seek and follow a treatment program. “Mental illnesses can develop for many reasons, such as biological predispositions, unfortunate life experiences or stress”, said Jung. Jung’s speech covered many facets of mental issues. She also provided resources for comprehensive help and prevention in the German system. “The earlier a depressive episode is treated, the lower the risk of a fallback. Talk to the person and ask how you can help. If they are reluctant, find the proper resource for the person. Usually employees with emotional or behavioral challenges are hesitant to talk about it. It’s important to start the conversation as soon as possible.” Jung reported.